Tantalizing Tuesday – Sesame Ginger Pork Tenderloin by Tossed Salad Life! Hey Y’all! My name is Emily and I blog over at A Tossed Salad Life. People often give me a strange look, or pause when I tell them the name of my blog. You see, I live in a stepfamily, which some people call a “blended” family. When I was engaged, a friend and mentor told me that living in a stepfamily was less like a blended smoothie, and more like a tossed salad. Each person has his/her own special flavor that stands alone, but together all of the pieces make something delicious. My blog includes deals with children, cookies, crafts and crockpot creations, I’d love it for you to stop by or connect with me via Facebook, Twitter, Instagram or Pinterest. I’m going to share with you a recipe for Sesame Ginger Pork Tenderloin. I’ve seen several variations of this recipe around the internet. I’m going to share mine, and let you know that you have two options for cooking it. First you can cook it on the grill. This is a great summertime option. Alternatively, you can cook it in the crockpot/slow cooker. I’m showing you the crockpot/slow cooker version because I wanted to make sure that it was ready when my husband got home from work. However, at the end of the recipe, I’ll let you know how to change the recipe for the grill. Place your Pork Tenderloin into your slow cooker. 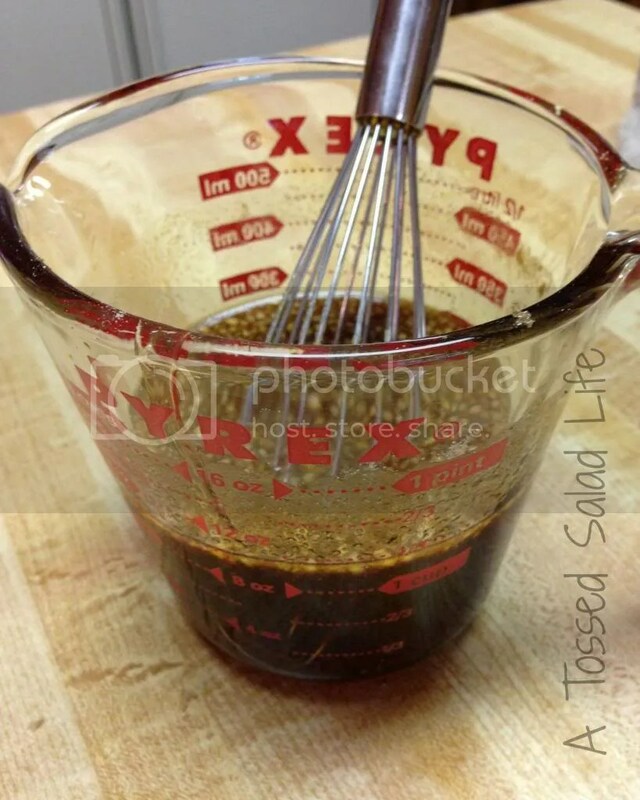 You should be able to make the marinade/sauce in a single 2 cup Pyrex measuring cup. Add all of those ingredients and mix thoroughly. The honey needs to be completely mixed into the soy sauce. Once it is blended, you can pour it directly onto the pork tenderloin. Cook the tenderloin on high for 4 hours, or low for 6-8 hours. We served it over rice. Now if you want to make it on the grill, here is what you will do differently: Place your pork tenderloin into a dish or gallon sized bag. After preparing the marinade, pour it over the meat, and let it marinade for at least 2 hours, but overnight is better. I always try to turn my meat during the day. When you are ready to cook the meat, take it out and roll it in lightly toasted sesame seeds. Cook on the grill until done. I hope you all will stop over to Emily’s blog (Tossed Salad Life)and see some of her other great creations. My goodness this meal looks delicious. I love the taste of sesame and I really like what you paired the pork with. I will definitely have to try it out soon! This looks delicious – I’ll have to try it! I came for the party and couldn’t find it.